Mojo bags, gone abstract: each piece in the show was created from the ingredients for standard Hoodoo spells, and took those ingredients, layering and arranging them within the resin, to create visually appealing "mojo bags" that hang on a wall. The show was a great success, and sold out. I got a few photos taken while working on the show this time. Painting with phosphorescent paints - yes, some pieces glow in the dark! Some of the many potential ingredients. Spruce, orange peel, lemon peel, tonka beans, wishing beans pyrite, magnet, basil in resin. Garlic, onion skin, red sandalwood, dragon's blood, lava, thread in resin. Fennel, mugwort, acrylic spheres, phosphorescent paint in resin. Spruce, sage, chile in resin. Cinquefoil, phosphorescent paint, spider in resin. Rose, honeysuckle, vanilla, orange peel, pearls, seashell in resin. Lemongrass, star anise, dandelion root, tiger eye in resin. Cardamom, juniper berry, spruce, gold, tonka bean in resin. Calendula, lovage, pyrite, red sandalwood, lavender in resin. 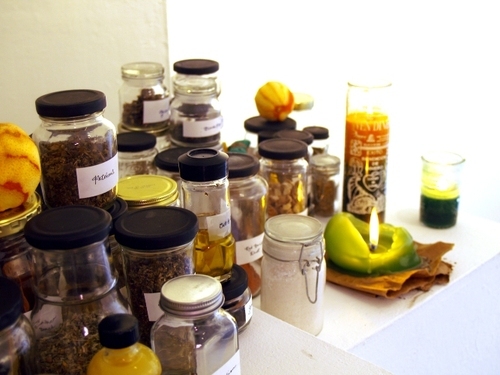 The show at the gallery was a great success, particularly the altar of ingredients he set out. Besides jars of wasps, black pepper, angelica, licorice, and lavender (among others! ), there were also candles to draw money and success, and red brick dust on the threshold to invite new customers. More ingredients and preparations, such as War Water, Chinese Wash, and Money Drawing Oil, were also displayed. On the last Friday of the show, Aidan offered quick readings to interested visitors.